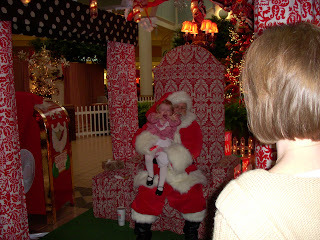 Everytime we ask Emily if she wants to go see Santa she says," NO! Ride horsey?" 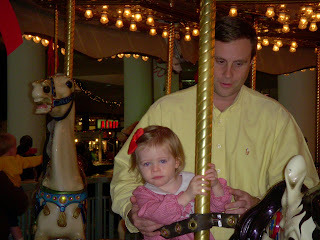 She saw Santa and rode the carousel all in one afternoon and the carousel was, of course, her favorite. She associates Santa with horses now. Emily LOVES horses after this experience. 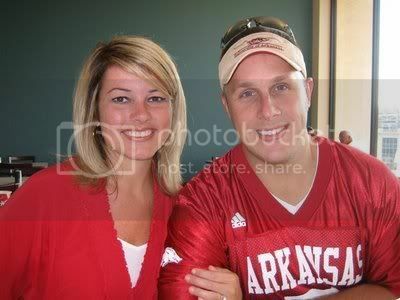 Her Daddy rode with her several times. Emily screaming for me to rescue her. PICTURES!!!!!!!!!! YAH!!!!!!!!! I'm so happy! Thanks for sharing!!! So cute!!!! Did you figure out how to do these your self???? Don't let the girls tease you Laurie. You are doing great! 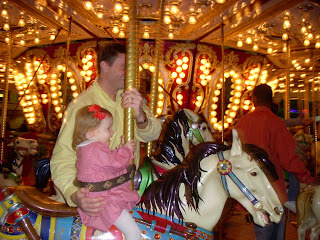 Love the pictures of Emily riding the horsey round and round! So sweet! Can't believe she is two!! Happy Birthday Emily!